The White House is the official residence of the American head of state, the heart of the executive branch of government, and the home to the presidents of the United States and their families. It welcomes prominent people and foreign heads of state, but also houses policy debates and critical decisions; running, shouting children; men and women taking their marriage vows; and families joined by the nation in mourning slain husbands and fathers. The White House is a living space, not only a historic site, but a place that sees the making of history every day. President John Adams opened the White House to the public and started the tradition of hosting New Year’s Day receptions. President Thomas Jefferson expanded on this tradition of hospitality and hosted the first Fourth of July celebration. Frequently at these events, people would line up to shake the president’s hand. Many chief executives reported red and aching hands at the end of these receptions, which continued into the early 20th century. The White House is still the only private residence of a head of state open to the public free of charge. White House tours of the great state rooms with their magnificent furnishings, including collections of antiques and portraits of the presidents and their first ladies, offer visitors a glimpse into the public lives of the presidents. The important work going on in the West and East Wings and the personal lives in the private rooms on the Second and Third Floors take place out of public view. President George Washington signed the Residence Act in July 1790 declaring that the Federal Government would reside in a district “not exceeding ten miles square…on the river Potomac.” City Planner Pierre (Peter) Charles L’Enfant laid out plans for the nation’s new capital and together with President Washington chose the site for the “President’s House.” In 1792, Washington and Secretary of State Thomas Jefferson held a design contest for the executive residence and the Capitol building. Irish-born architect James Hoban won the competition to design the “President’s House,” the first public building erected in the newly created federal city of Washington. John Adams moved into the unfinished building in November 1800, the first president to live in the presidential mansion. The White House Grounds and the surrounding parkland, known as President’s Park, provide an elegant setting to welcome foreign dignitaries and to host national celebrations such as the lighting of the National Christmas Tree and the annual Easter Egg Roll, and on occasion public protests. President’s Park reflects the plans of first L’Enfant and later Andrew Jackson Downing and the 1902 McMillan Plan to connect the White House with the monuments of the National Mall, the United States Capitol, and the Lincoln Memorial. The 1902 plan envisioned the sweeping lawn and tree-lined vista that today with the public buildings and monuments creates a symbolic city core that honors our most revered presidents and the great events of the nation’s history. The Ellipse is the central landscape feature on the south side. Lafayette Park, on the north side, is surrounded by many historic buildings of interest and is the site of an equestrian statue of President Andrew Jackson and a number of statues of Revolutionary War heroes erected in the late 19th and early 20th centuries. In the mid 1930’s, President Franklin Roosevelt contracted Frederick Law Olmstead, Jr. to modify the grounds and gardens to provide more privacy for the first family. Constructed from Aquia sandstone between 1792 and 1800, the Georgian exterior of the White House survives largely unchanged, except for the famous south and north porticos, which Hoban added in 1824 and 1829 to 1830, and the West and East Wings. The West Wing evolved from its original construction in 1902 to its present form by 1934. The East Wing was completed in 1942. The interior of the White House has undergone three important reconstructions. During the War of 1812, the British destroyed the executive residence, when they burned Washington’s public buildings in 1814. A summer thunderstorm put out the fire, but all that remained was a charred and badly damaged shell. President James Madison brought Hoban back to rebuild the mansion. During the administration of President Theodore Roosevelt, extensive renovations were undertaken lead by the architects of McKim, Mead & White. During his administration, President Roosevelt officially changed the name of the residence to the White House. In 1948, a thorough examination of the house revealed that the alterations and remodeling overtime had weakened the old wooden beams and interior walls. President Harry S. Truman and his family moved across the street to Blair House while, between 1948 and 1952, workers carefully removed the historic interiors and installed a new steel and concrete framework that replaced the old, badly deteriorated timbers. Presidents and their wives added modern conveniences and replaced finishes and furnishings to reflect current tastes and personal preferences. Andrew Jackson was responsible for modern amenities such as running water and an indoor bath. The year 1848 saw the installation of gas lighting during the James K. Polk administration. In 1891, President Benjamin Harrison made notable changes including adding electric lights. The public rooms reflect the stories of the men and women who lived in this house and the events, both public and private, that occurred here. The East Room is the largest space on the first or State Floor. When John Adams moved into the President’s House for his last few months in office, his wife Abigail used the unfinished room to dry the family laundry. Mourners filed by the bodies of seven presidents lying in state here. President Ulysses S. Grant remodeled the room for his daughter’s wedding in 1874. Theodore Roosevelt’s children roller-skated on the newly installed wood floors in 1902, and his daughter Alice married Congressman Nicholas Longworth in a famous East Room ceremony four years later. President Lyndon Johnson signed the 1964 Civil Rights Act here. The Gilbert Stuart portrait of George Washington that Dolley Madison rescued when the British invaded Washington in 1814 now hangs in this room. President James Monroe played the card game whist with his friends in what is now the Green Room, but it did not become a “Green Drawing Room” until the John Quincy Adams administration. Changes in cultural styles and personal tastes of the presidents and first ladies influenced the evolving appearance of the White House interiors. For example, President Chester A. Arthur, enamored with the new Aesthetic movement and the work of Tiffany, thought Lucretia Garfield’s highly patterned finishes were out of fashion, and redecorations have been frequent. Grace Coolidge furnished this room with authentic 19th century furniture, in an early attempt to restore the White House to its historic appearance. The Blue Room has not always been blue either. 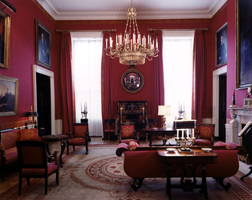 Dolley Madison called it her “Oval Drawing Room” and decorated it with red velvet draperies. James Monroe imported fashionable Empire furniture upholstered in crimson silk from France to decorate his “large oval room.” Some of those pieces, reupholstered in blue, stand there today. President Martin Van Buren began the tradition of decorating the room in blue, which continues to today. Used often as a reception area, this room has seen many important visitors, including the chiefs of Great Plains tribes who had tea with James Monroe in 1822 and the first Chinese ambassador to the United States when he presented his credentials to President Rutherford B. Hayes in 1878. It has also witnessed personal events. The wedding of President Grover Cleveland took place here in 1886, and the christening of President Dwight Eisenhower’s granddaughter, Mary Jean, was another reminder that the White House is also a home. Dolley Madison held her famous Wednesday night receptions in the Red Room, though it was not red, but sunflower yellow at the time. It did not become a true “red room,” until the Polk administration. In March 1877, it saw Rutherford B. Hayes secretly sworn in as president, after one of the most bitterly contested elections in the nation’s history. The White House swearing-in was intended to anticipate anything that might disrupt the formal inauguration at the Capitol, scheduled for the following Monday. Ulysses S. Grant, his predecessor, left a dinner party in the next room to attend the ceremony. Presidential families often used this room for informal Sunday evening gatherings in the 19th century. The State Dining Room, which can now seat 140, originally was much smaller. By the 1850s, it already could not hold the many congressmen, diplomats, and other distinguished guests invited to attend official dinners. In 1902, architects McKim, Mead & White enlarged the room to its current dimensions by removing the stairway from the west end of Cross Hall. Franklin D. Roosevelt had the blessing that John Adams wrote for the White House in 1800 carved in the large stone mantelpiece. Today this room is the center of White House hospitality. Hoban designed the Entrance Hall and Cross Hall as a formal reception area and circulation space connecting the main rooms on the State Floor. In the 19th century, the public entered the White House through this space. In 1837, Andrew Jackson invited everyone in to help him eat a 1,400-pound cheese he received as a gift. The resulting mob trampled so much cheese into the carpeting that it took months to remove the smell. The 1902 renovation relocated the public entrance to the White House to the East Terrace, but the president and his wife still welcome state visitors in the Entrance Hall. The Second and Third Floors are private living quarters, used only by the president, family, and guests. This part of the White House was a joyful place when Grover Cleveland’s daughter, Esther, was born here. She is the only child of a president born in the White House, although several grandchildren have been born here. Abigail Fillmore, a former schoolteacher, established the first official library in the White House on the Second Floor in 1850. It was home to Theodore Roosevelt’s rambunctious children. 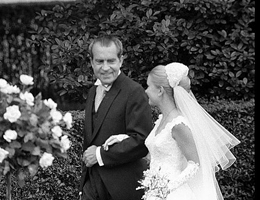 His daughter Alice Roosevelt Longworth once exclaimed at a small dinner party held during the Richard M. Nixon administration, “My goodness . . . this is the room where I had my appendix out!” The operation performed in the President's Dining Room, had been in her old bedroom, the Prince of Wales Room. The private quarters of the White House also witnessed scenes of great sadness, with the death of Willie Lincoln and the painful dying of President William H. Harrison, to name a few. Today the White House contains 132 rooms and 35 bathrooms on six levels. There are also 28 fireplaces, eight staircases, and three elevators. A tennis court, jogging track, swimming pool, movie theater, and bowling alley reflect the active lives led by today’s presidents and their families. The National Park Service maintains the White House Gardens and Grounds, the surrounding parkland known as President’s Park, and provides interpretive programs in the park and at the White House Visitor Center. 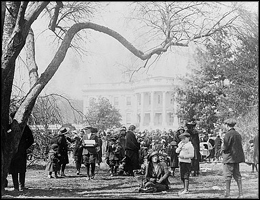 The White House Historical Association produces educational literature and films, develops special programs, and maintains a web site interpreting the White House and its history and the persons and events associated with it. The Association published the first official White House guidebook in 1962 and continues to publish books about the White House. The White House, located at 1600 Pennsylvania Ave., NW, Washington, DC, is a National Historic Landmark, although it is legally exempted from listing in the National Register of Historic Places according to the National Historic Preservation Act of 1966. For detailed information on touring the White House and President’s Park visit the National Park Service President’s Park (White House) website. Click here for the National Register of Historic Places file for President's Park South: text and photos. The White House Visitor Center, managed by the National Park Service, includes exhibits and a short film, which offer glimpses into the White House and its history. The White House Historical Association website provides an intimate look into the history of the White House including those who lived and worked there since its beginning. The association’s website has detailed information on the White House Visitor Center and the exhibits offered by the National Park Service. Visit the White House Visitor Center located inside the north end of the Department of Commerce Building between 14th & 15th Sts. NW, at 1450 Pennsylvania Ave., NW. For information, call 202-208-1631. The center is open daily from 7:30am to 4:00pm except for Thanksgiving, Christmas and New Year's Day. Walk through six permanent exhibits relating to the White House including the First Families in the White House, Symbols and Images, White House Architecture, White House Interiors, Working White House, and Ceremonies and Celebration. The White House Historical Association has a gift shop in the Visitor Center. Public tours of the White House are available for groups of 10 or more people with special arrangements for the handicapped. Requests for American citizens must be submitted through one's Member of Congress and for others through the embassy of their nation of citizenship. Requests should be submitted as early as possible; the number of tours is limited. Arrangements are accepted up to six months in advance. To contact your representative and senators, please call the U.S. Capitol switchboard at (202) 224-3121. The self-guided tours are available from 7:30am to 12:30pm, Tuesday through Saturday (excluding Federal holidays), and are scheduled on a first come, first served basis approximately one month in advance of the requested date. All guests 14 years of age or older are to submit their name, date of birth, social security number and country of citizenship to the requesting office. Attendees under the age of 14 only need to submit their name and date of birth. This security information must be received by the congressional office or embassy through which tickets are obtained no later than five business days prior to the tour date. All White House tours are free of charge. For the most current tour information, please call the 24-hour line at 202-456-7041. Please note that White House tours may be subject to last minute cancellation. The closest Metro stops are Federal Triangle, Metro Center, and McPherson Square. Groups should enter the White House complex from the south side of East Executive Ave. near the Southeast Gate. 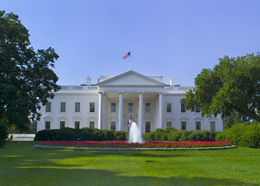 The official White House website also offers detailed information including history of the residence and online virtual tours. The White House, White House Grounds and Ellipse, and Lafayette Square have all been documented by the National Park Service’s Historic American Buildings Survey. 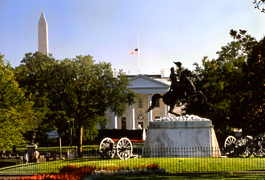 The White House and Lafayette Square are both featured in the National Park Service Discover Our Shared Heritage Washington DC travel itinerary.